Figure 7.29 Schematic drawing of a microelectrophoresis apparatus showing the positioning of the anode and cathode and the capillary in which the velocity of particulates is monitored to allow calculation of zeta potential. fashion. 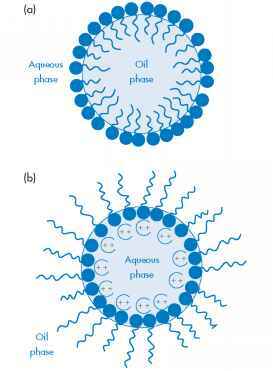 Flocculation, unlike coalescence, can be a reversible process and partial or controlled flocculation is attempted in formulation, as discussed above. Caking of the suspension, which arises on close packing of the sedimented particles, cannot be eliminated by reduction of particle size or by increasing the viscosity of the continuous phase. Fine particles in a viscous medium settle more slowly than coarse particles but, after settling, they form a more closely packed sediment which may be difficult to redisperse. Particles in a close-packed condition brought about by settling and by the pressure of particles above thus experience greater forces of attraction. Flocculating agents can prevent caking; deflocculating agents increase the tendency to cake. The addition of flocculating and deflocculating agents is often monitored by measurement of the zeta potential of the particles in a suspension. Most suspension particles dispersed in water have a charge acquired by specific adsorption of ions or by ionisation of ionisable surface groups, if present. If the charge arises from ionisation, the charge on the particle will depend on the pH of the environment. As with other colloidal particles, repulsive forces arise because of the interaction of the electrical double layers on adjacent particles. The magnitude of the charge can be determined by measurement of the electrophoretic mobility of the particles in an applied electrical field. A microelectrophoresis apparatus in which this mobility may be measured is shown schematically in Fig. 7.29. The zeta potential (Z) is not the surface potential discussed earlier but is related to it. Therefore Z can be used as a reliable guide to the magnitude of electric repulsive forces between particles. Changes in Z on the addition of flocculating agents, surfactants and other additives can then be used to predict the stability of the system. The changes in a bismuth subnitrate suspension system on addition of dibasic potassium phosphate as flocculating agent are shown in Fig. 7.30. Bismuth subnitrate has a positive zeta potential; addition of phosphate reduces the charge and the zeta potential falls to a point where maximum flocculation is observed. In this zone there is no caking. 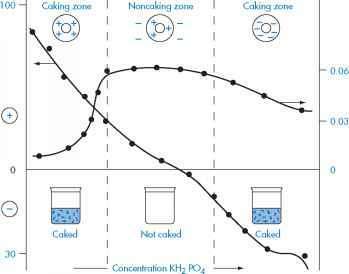 Further addition of phosphate leads to a negative zeta potential and a propensity towards caking. Flocculation can therefore be controlled by the use of ionic species with a charge opposite to the charge of the particles dispersed in the medium. The rapid clearance of the supernatant in a flocculated system is undesirable in a pharmaceutical suspension. The use of thickeners such as sodium carboxymethylcellulose or bentonite hinders the movement of the particles by production of a viscous medium, so that sedimentation is delayed. The incompatibility of these anionic agents with cationic flocculating agents has to be considered. A technique to overcome the problem is the conversion of the particle surfaces into positive surfaces so that they require anions and not cations to flocculate them. Negatively charged or neutral particles can be converted into positively charged particles by addition of a surface-active amine. Such a suspension can then be treated with phosphate ions to induce flocculation. Figure 7.30 Caking diagram showing controlled flocculation of a bismuth subnitrate suspension employing dibasic potassium phosphate as the flocculating agent. Bonds between particles in flocculated sulfamerazine suspension.